I came to New York in 1978 at the age of 22 in pursuit of my dream of being a songwriter. I would wait my turn to get a chance to play one lousy song in some dark, smoky, noisy room in hopes of being discovered. Waiting in the dark in pursuit of the same dreams were Christine Lavin, Cliff Eberhardt, Shawn Colvin, Suzanne Vega, John Gorka, and Lucy Kaplansky. I am very proud to have shared such a vital and rich history with musicians who I hold in such high esteem. It was a special and unique time, and, although it was filled with heartbreak and despair, I wouldn’t trade one second of that rich time in my life. Happily, I became friends with many of these special people, especially Christine. We were very in touch with each other’s ups and downs. She’d have a new manager, and I’d lose my old one. She’d get a gig, I’d get a gig. And we sent each other tapes of our newest songs. I tell you all this because it really figures into my happy equation. Dreams are essential, but they sure don’t pay the rent. For years, I worked various temp jobs while gigging at night and sending songs out whenever possible. I demonstrated vacuum cleaners, Mr. Coffees and toaster ovens. I worked the flea markets, as a proof reader, for a dentist, and at a Venetian blinds factory. It was a struggle. No health benefits. No money for recreational purposes. Desperation. Self doubt. Fear. We all know what that’s like. But, all the while, I clung to my dream like a life preserver. I knew why I was born, and no one could discourage me from reaching my mountaintop. I was willing to die trying. Honest I was. I finally gave in to taking a full-time job as a secretary at HBO in 1984. It was a smart move. Ah, the magic of a steady paycheck. In my spare time and evening hours, I was of course still gigging, writing songs, and dreaming my big dream. Now, however, I didn’t have that horrible daily struggle of keeping my head above water financially. In 1985, just before my 30th birthday, my parents sent me the piano I grew up playing. I had just served as a juror on an emotionally trying case, my brother had just married, and I was questioning my life to date, wondering what my future could possibly hold. I took the day off work to be home when my piano arrived, and I remember how it glistened in the sun as the movers lowered it off the truck. My piano. My truest love and friend. My confidante. Back together again after all these years. remember hugging it and polishing it. Then I went to bed. My bed was a high loft bed, and I looked down on my piano all night to make sure it was really there. The next day, I sat down and “From a Distance” just poured out of me. On one hand, it took me two hours to write. On the other hand, it took me 30 years. Pick whichever hand makes you happy. I love them both. identifying herself as Nanci Griffith. Christine had sent her the song, she loved it, and was asking to record it. That magic moment was the beginning of my big break. Allow me to tell you a little bit more. First post from the west coast. 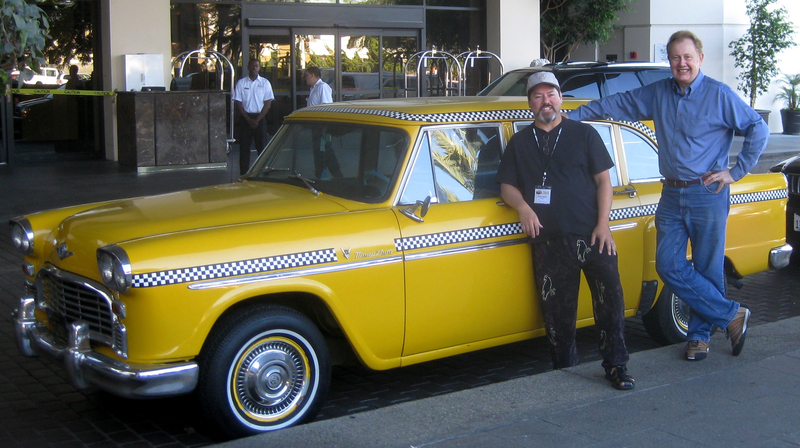 I’m writing from the 12th Annual Taxi Road Rally, a mecca for serious songwriters. In this post I’ll give you an overview of what goes on at a typical Road Rally. Over the next few days I’ll share some of the goodies I learned. If you are not familiar with it, the Road Rally is a convention for songwriters, those who are recording artists themselves (singer/songwriters and the like) as well as those who don’t perform, but who write songs for other recording artists and music for film and TV. The convention is limited to Taxi members and their guests and it is free. As someone who is now attending his 4th Road Rally, I can say without qualification that it’s a truly an easy way to meet industry people and peers, learn a boatload of ‘insider’ information in a few short days and have a great time doing it. The information I’m talking about is not only about songcraft fundamentals, writing melody, chords, lyrics, how to re-write, collaborate, record and mix demos (and much more), but also info on the business side: how to build a fanbase, use email to sell more merch, how to pitch songs, indie marketing and PR, etc. This info came in the form of workshops, panels, one-on-one and small group mentoring sessions, plus all the random interactions at meals, in the hallways, in song circles, open mikes and late night jams. One particularly inspiring moment was when Taxi CEO Michael Laskow presented the Living Legend Award to Lamont Dozier, co-writer of such Motown hits as Heat Wave, Where Did Our Love Go, How Sweet It Is (to be loved by you), Baby Love, Come See about Me, Stop in the Name of Love, I Can’t Help Myself (Sugar Pie, Honey Bunch), I Hear a Symphony, It’s the Same Old Song, This Old Heart of Mine, Jimmie Mack, You Can’t Hurry Love, Standing in the Shadows of Love, Reach Out I’ll Be There, Band of Gold, Give Me Just a Little More Time and many more, but my fingers are getting tired. After the Motown Era, he continued to write hit songs for himself and other artists.